The doorframes are supplied at the width of the wall, from 60 to 500mm in intervals of 10mm. 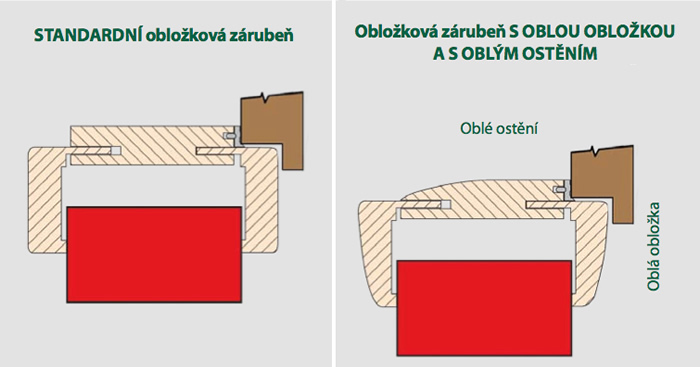 The adjustability of the casing for walls with a width of 60, 70 mm is 0 +5 mm, while in other walls with a width from 80 to 500 mm it is −5 +15 mm. The doorframes are also supplied in a fire resistant model: the fire resistance is EI230 (EW 30). The doorframe with a rounded edge and a rounded jamb improve the overall aesthetic impression provided by the door and the doorframe together. We supply doorframes with a rounded casing and a classic jamb for all wall widths from 60 to 500 mm and in all designs. The combination of a rounded casing and jamb can be supplied in doorframes for wall widths from 80 to 150 mm for all FOL and CPL surfaces (this is not possible for fire resistant doorframes, for sliding door doorframes and for the casing on steel doorframes). It is possible to deliver doorframes with both a rounded casing and jamb or merely with a rounded casing. The variant with only a rounded jamb is not possible. We supply the doorframe with a rounded casing and with a classic doorjamb for all wall widths from 60 to 500 mm and in all designs.